Sierra Leone FIFA referee, Thomas . Kangoma,has been appointed to officiate Sunday’s premier league crunch clash between Mighty Blackpool and FC Kallon at the Siaka Stevens Stadium in Freetown. The Freetown based referee will be assisted on the line by Musa A. Sandy as AR 1 and Umaru Tarawally AR 2 in the crunch clash, which has already been dubbed as the Western derby, while Muskuda Sesay will serve as the fourth official. Meanwhile, there is uncertainty over Sandy’s officiating as AR 1 in the said match after an off-field statement he allegedly altered against FC Kallon. Referee Kangoma was the man in charge of the 2013 Premier League clash between Ports Authority and Old Edwardians at the football Academy grounds, Kingtom in which he dismissed both Aliyah Fofanah of Old Edwardians and Alhassan Sesay of Ports Authority for ugly an incident in the 36minutes. 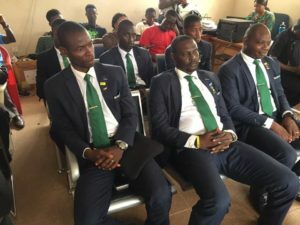 The FIFA referee was appointed by CAF to officiate the 2019 Africa U-20 Cup of Nations qualification between Liberia and Benin. On Saturday, Dawdu Williams will take charge of East End Tigers home match against Kamboi Eagles in Lungi and will be assisted Idrissa O Conteh AR 1 and David B Mohamed AR 2 while Joseph Foninge will serve as the fourth official. And in Freetown at the Siaka Stevens Stadium, Kelfala M Koroma from Kenema will be the man in the middle for Old Edwardians home match against RSLAF to be assisted by AR1 Victor B Trye and AR 2 Minkailu Abdulai all from –Kenema and Michael King from Freetown will serve as the fourth man. Port Loko duo, Alhaji Musa Kabia and Mohamed S Sesay will serve as central referee and AR 1, while Foday Kamara from Lungi will run as the AR 2 and Abdul George from Bo will serve as the fourth official for Bo Rangers home clash with Central Parade. The Eastern clash between Anti Drugs and East End Lions will involve the central man, Swahib Bangura, and assisted by Dauda Sheriff, and Ibrahim Kargbo. The fourth official is Zainab Wilson.